Salute Your Shorts is easily my favorite ’90s Nickelodeon show. It became synonymous with the summers of my childhood. Watching Nick In the Afternoon and hoping that Stick Stickly would announce it up next was perhaps the most anxious my life got at such a young age. It ran from 1991 to 1992, but Nickelodeon syndicated it well until 1998, to where it was even among the top 15 highest-rated regularly scheduled basic-cable series in 1996, according to Nielsen, despite not having aired a new episode in four years. The memory of Terminator 2 from my childhood is a foggy one, but I remember, as a child who couldn’t have been any older than 10, that I really liked this movie. There were scenes that, to this day, have stuck with me. I remember the ending almost shot-for-shot as I rematch it some 16 years later. I like the first Terminator film a great deal, but it has that ’80s feel to it and it’s very dated. But the 1991 sequel is ahead of its time. And 24 years later, It holds up perfectly–just as my memories of it as a child. 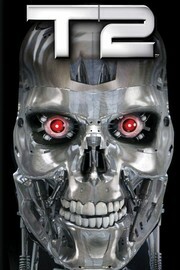 In this movie, a cyborg (Arnold Schwarzenegger), looking exactly like the one who tries to kill Sarah Connor (Linda Hamilton) in the first film, is sent back to the past to protect her son, John Connor (Edward Furlong), who is being hunted down by a more advanced evil cyborg (Robert Patrick) who can morph into any person or metal object. The plot is more developed and longer. We realize that there is more at stake here. We know the background already and know who must live and who must die. At 2 and a half hours, the movie never seems to overstay its welcome. Schwarzenegger has never been more perfect for any role he’s played. He’s truly at his best and even displays his comedic talents. Patrick, playing the main antagonist, creepily stalks Sarah and John throughout the whole movie, evoking true fear from the audience. This is a near-perfect cinematic experience. It’s one of my favorite films and it’s even better watching it with more context than when I was a child. I always say that even the worst movie is good if it has Billy Crystal in it. And although Crystal helps make this film what it is, along with a great supporting cast, it’s really a nice story. It’s about a man’s second coming-of-age and it’s about camaraderie and second chances. The comedy is slightly irreverent and jarring, as it is partially a satire. It juxtaposes tragedy with humor, but that goes along with the film’s theme of “That’s life!” And although the intermittent jokes may disrupt and off-put the film’s tone at times, the build up to the 3rd act is well worth the wait. Even if the humor is not for you, the story is undeniably charming. 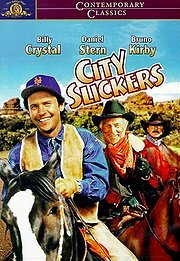 If I ever get to the point in my life where I’m facing a midlife crisis, I will be sure to queue up City Slickers. For a comedy, the writing in this movie is superb. There aren’t any silly plot holes or goofs that stand out. This film just doesn’t do anything to annoy you. With circumstances that are easily related to and fun in-jokes you feel like you’re on the journey with them. And as someone who hasn’t yet gotten to their midlife crisis, this movie makes me realize that it won’t be so bad.